Ewww… This worksheet is pretty creepy, what with the bugs crawling all over it. What’s worse, one of the bugs is poisonous! 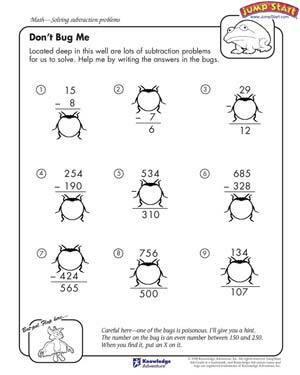 To find the poisonous bug, kids must first find the answers to each of the subtraction problems. Flap’s hint will then lead them to the poisonous bug.